Young children living in poverty experience unique barriers to food access, stable housing, employment, healthcare, and social support. These barriers can hinder a child’s ability to achieve academic success. In addition, children living below the poverty line may struggle with finding stable and substantial employment as adults. 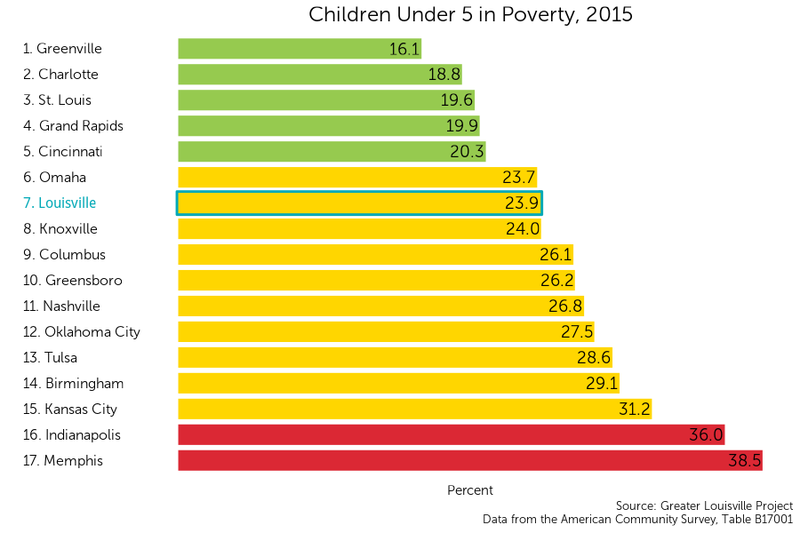 Louisville currently ranks 7th among its peer cities in child poverty among young children, with 23.9% of children under the age of 5 living in poverty. The poverty line in 2015 was $15,930 for a family of two and $20,090 for a family of three. Louisville is in the middle of its peer group according to a natural breaks algorithm. Cities in green are those that outperform their peers, cities in yellow represent the middle cluster, and those in red are a group that lags behind its peers on this indicator. Where is childhood poverty found in Louisville? Although Louisville ranks 7th out of 17 cities in child poverty rates, child poverty varies substantially within the city, ranging from 67% in some neighborhoods to 4% in others. In the map to the left, areas with high rates of child poverty are purple, and areas with average to low rates are white. Child poverty is most concentrated in Louisville’s western and downtown neighborhoods. Russell, California, Smoketown, and Park Hill are several neighborhoods with particularly high rates of child poverty. The lowest rates of child poverty are in Floyd’s Form, the Highlands, and Northeast Jefferson. Scroll over the map to see values for each census tract. Zoom in to see street names that form the boundaries of each tract. Child poverty rates in Louisville have steadily decreased since 2011. 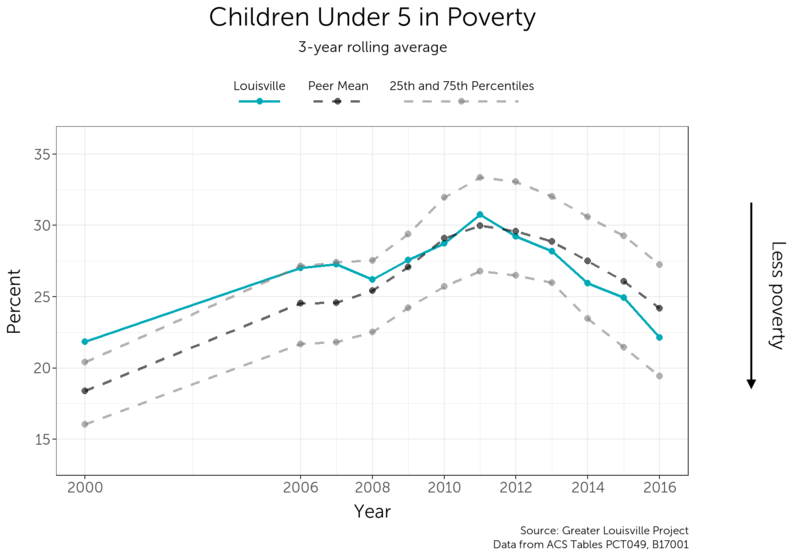 While Louisville’s child poverty rate is in the middle of its peer cities’, the child poverty rate in Louisville has decreased much faster than its peers since 2011. Concerted efforts to eradicate child poverty could create a foundation that would place Louisville in the top tier of cities for generations to come.